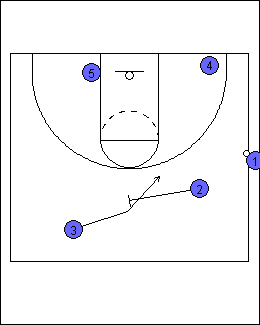 This is a simple sideline out-of-bounds play that works surprisingly well. It opens up the court around the basket and often results in lay-ins or dink shots. Player 1 should be an excellent ball handler, driver, passer, and decision maker. Player 4 should be fast and a good passer. Players 2 and 3 should be good ball handlers. On the slap of the ball, Player 5 sprints to the opposite low block, and Player 4 sprints to the ball-side elbow or the ball-side baseline near the three-point line. Player 2 takes two strong steps forward, and Player 3 back pedals about six steps and very high. Player 1 pretends to focus on Players 2 and 3, but he is actually hoping to hit Player 4. If Player 1 is able to pass to Player 4, then he sprints directly toward the hoop, hoping for a return pass for a lay-in. If Player 5's defender helps on him, Player 5 should be open for a dink shot. After the initial two steps toward Player 1, Player 2 turns and runs to set a screen for Player 3 high above the top of the key. Player 3 comes off the screen. After Player 3 clears the screen, Player 2 should open up to the ball. Player 1 should be able to hit Player 3 or Player 2. When this happens, the court is still spread and the defense extended enough to allow for penetrations by Players 3 or 2. 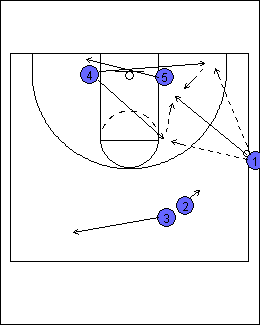 As this evolves, Players 4 and 5 need to read the situation and break to open areas or get into rebounding position. After passing, Player 1 gets into the playing area in position to receive a return pass if the defense some how bottles everything up. I like your plays. Gives good options and gets everyone involved. One suggestion: for those who may be beginner coaches, when you lay-out plays, define whether they are against a zone or man-to-man. Giood point! Both of these plays are designed for man-to-man defense. If you run them against a zone, the results will be hard to predict. The picket-fence play does create an overload; that's for sure. We should have an offense section to the website in the near future. carel...this play ... or any "play" didnt make you lose im sure if you go back and look at film and it make take 50 to 90 times looking at film but you would realize the decisions or lack there of ...during the play are what made you a "loser"
this website is very unhelpful!!!!!!!!!!!!!!! Carel, I have to agree with Michael on this. One play does not cost you the game. How many FT's did your team make, how many TO's? I think this is a great looking play and plan on adding it to mine. Get out of coaching if you blame losing a championship on a blown play. I agree with coach G, look at other stats. As a veteran coach of 12 yrs, I would like to add a comment to carel's comment. It is my experiance that many young coaches (and by saying young, I am asuming you are fairly new to coaching) like to find blame for situations gone bad, when the blame is none other than the complainer himself. Keep in mind that as a COACH you are a teacher, and your actions influeant theses athletes. Coaches are looked upon for guideance and direction in the lives or our student athletes. Winning is NOT everything, winning is simply a reflection of something you or a TEAM have acheived as a result of preperation. Life is full of obsticles, trial and errors, and let downs. This is why we practice, and study to prepare ourselves for success. And if we fail, we evaluate the situation, and begin to prepare ourselves again. Excuses are for the unprepared minds. It is my opion that if a coach is overly concerned with WINNING, and that being had focus, then that coach is to concerned with his own self rather than the TEAM! Please exuse my errors in my comment placed above. My thoughts sometimes get a head of my typing. I do want to add that I have looked over the plays, and I plan on making a few motifications to better suit my coaching methods, and philosophies. But over all these plays look great. Hey guys. I hate to squelch the discussion, but based on my experience in such forums and the way carel lays out his/her comment, I'm pretty certain that it was only done to lure you. It created controversy and made people waste time responding to someone who probably has never run the play or even coaches. As a beginner coach I have found this website to be very helpful. Even a 1hr practice on Thursday night would have been stressful for me without your tips. I dont claim to know everything about the game but have learned its much easier coaching from the bleachers. Hats off to everyone who puts in the time to teach the kids! PS. we won again today! I am pretty sure Carel was joking amongst coaches. I am pretty sure most coaches at any level understand that one play is not why the team lost a game. Wonderful! I'm a state futsal coach in Australia, and I'm using this play in national championships in January. Don't tell the Victorians but! I feel like that Carel is probably a player on a losing team rather than a coach! Surely, since anyone can post on here, a coach would never resort to those comments. I for one use these plays and they have worked very well for me. Thank you for the plays - while I have coached hoop [youth through junior high] for many years and had all of my sons at one point - I still feel the need to use new/other resources for my coaching. I've coached lots of sports and have found that each season brings a new team/composition with its own challenges and joys. It is most rewarding to coach/teach well and witness the growth in each athlete - skill-wise as well as personal growth-wise! Thanks again for sharing the craft. Hahaha... this was like a psychology test in itself, everyone initially thought it was a coach (including myself), but Coach Kathy was the only one astute and open-minded enough to consider it was a player! As for me, I'm coaching a 6th grade girls team, and it's tough to find good plays that fit our personnel (ie. no real good outside shooters, nobody strong enough to make long, accurate passes). I also need plays to be simple enough for them to remember. If anyone has any really simple, but effective plays, please share! I just got back from AAU national (U11G). I saw this play ran and it was successful and this was against well prepared and very athletic opposition. The key is that player 1 needs to be an aggressive offensive player than wants the ball and will go strong to the rack. I've ran this for years. VERY effective the first 2-3 times you run it and then the D will catch on. The key is to have more than one play with several options.... that makes it more difficult to defend... and then its all about execution. Is the offense better or is the defense better.